You may have experienced connectivity issues when trying to upload your test recording to Panaya. There are several ways in which you can try and self-resolve this issue and re-upload the recording to Panaya's servers. Verify that your internet connection is working properly and use the Recover Now option. If problem persists, try to disconnect from the internet, reconnects and click on Recover Now. 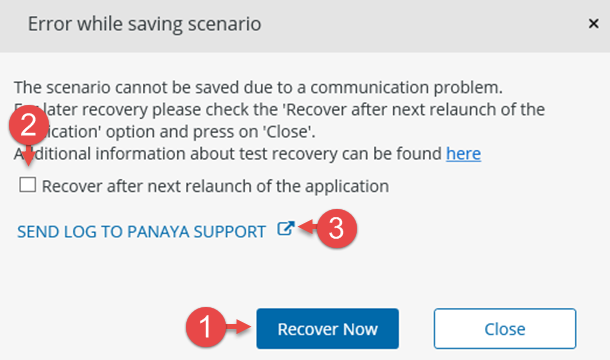 If you select this option and click close, Panaya will attempt to recover any recordings that were not yet uploaded to Panaya, on your next recorder launch. When you initiate the Panaya recorder again, it will display any existing recording information that had previously failed to upload. If this is an on-going problem, use the Send log to Panaya support option, on the next attempt. An email template will be created, with the log files locations. Please locate the log file within the location provided and attach it to the email. How to retrieve log files for Panaya Support?